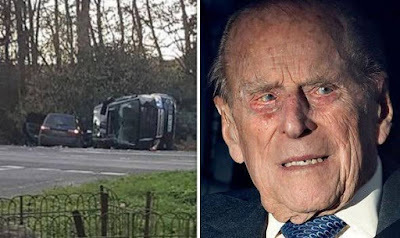 Ninety-seven year old Prince Philip, husband of Queen Elizabeth 11 of England was involved in a vehicle collision yeterday. Many feared the worst for him, but Prince Philip who is also the Duke of Edinburgh, came out if the accident unhurt except for bruises. The Duke was driving a Land Rover when the accident took place. Two women in the car th Duke's vehicle collided in, were rushed to the hospital but later on discharged.